One of the qualities that makes Ipe so beautiful is the natural variation between boards. Builders don’t use the same building materials on outside projects as they do with inside projects because they won’t last. Sunshine bakes and dries them, insects gnaw at them, water encourages rust, dislodges things and then there is the shrink-swell cycle. Over time humans have learned to treat or manufacture materials that stand up better to Mother Nature’s challenges. It seems that Mother Nature had an answer for us all along: it’s called ipe (pronounced “Eee-pay”). Ipe is known by a variety of names including Brazilian Walnut, Ironwood, Cumaru, Brazilian Teak, Garapa, Brazilian Oak, Pau Lupe, Tigerwood and Massaranduba. 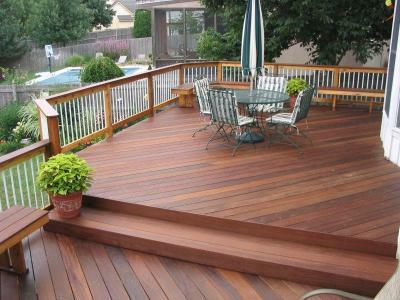 It is farmed in several places in South America, but comes primarily from Brazil and is the most sought after tropical hardwood decking material in the U.S. today. Why? Mother Nature built Ipe to last. Seriously. It practically has superpowers. Ipe is three times harder than cedar and if you try to secure it with a steel nail, the nail will bend. 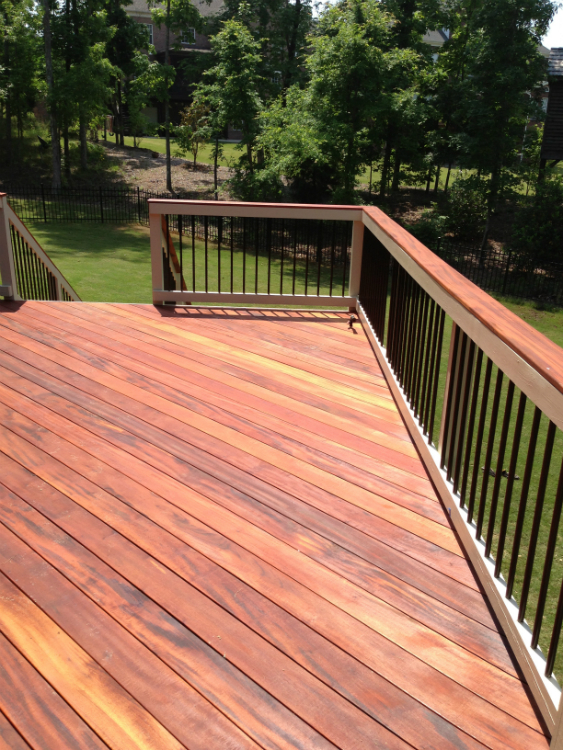 Builders experienced in working with Ipe, like Archadeck, pre-drill holes and use screws to install it. Even then, we keep the screws in a dish of hand soap so that we when we install the screws they won’t break from the friction. You can also secure Ipe using hidden fasteners which are very popular. Ipe’s equatorial home has helped it evolve into a wood that doesn’t rot, splinter or succumb to insect attacks. It’s arguably the hardest hardwood in the world. Like any good superhero, Ipe is also attractive and charismatic. Ipe boards have a warm, rich, almost reddish color and each board has a tight grain and unique look. People love it because it looks similar to a premium indoor wood floor–it makes for a stunning finished product. Many owners treat the wood with paraffin wax every year or two to seal the boards and help maintain their color. If they aren’t treated they will remain strong, but will weather to gray. You can see Ipe in action in large, famous public spaces like New Jersey’s boardwalk and in front of Treasure Island in Las Vegas. If you are looking to bring an indoor look to your outdoor project, want to minimize the use of chemically treated materials in your yard or want something that has the strength to last 70-100 years at the cost of a quality composite board, Ipe may be the choice for you. The team at Archadeck can answer your questions and give you more information about Ipe and its super qualities.